Watching Greek series can really help you learn the language, or just freshen up your Greek. Especially when talking about some of the best Greek TV shows of all time! GreekPod101.com presents you with ten of the most popular Greek TV series, which can help you learn Greek in a fun and interesting way. The easiest way is searching for each title on Google; this way, you can find almost anything. So, what are you waiting for? Browse through our selected series and find the one that suits your taste. We’re sure you’ll find one you like from our picks of the most popular Greek TV series, whether you find Greek TV shows online or Greek TV shows on Netflix. Let’s get started! Stella is an overweight Greek woman residing in Melbourne, Australia. Vicky is also a Greek living in Melbourne; however, she is a beautiful model. Once Vicky gets engaged to Nikos, she’s off to Greece to meet his parents. On the plane to get there, she discovers that she’s traveling along with her friend, Stella. Then, an extraordinary thought pops into her mind, while being extremely stressed about meeting Niko’s parents: What if they switched places? A series of unexpected and hilarious events follow. This is an all-time favorite series for many people in Greece. It includes the concepts of love, hate, discrimination, immigration, and more, as you get to know a classic Greek family and their perceptions. Unique characters and an intriguing, humorous story set the perfect basis for success. The language used is simple and without many idioms or strange accents. 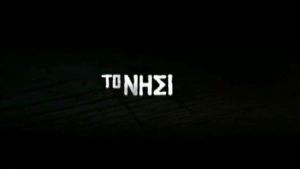 As a result, this is definitely a great Greek television series to watch while studying the language. Romanization: I zoí íne teliká mía terástia pláka. Look at them! They seem like a group of happy friends, but…they’re not! This is another comedy series, which is popular to this day. When Alekos, a married man, falls in love with Flora, who’s also married, a series of perplexed events take place. The story is centered around his wife, Sosó, who discovers the cheating and is determined to kill him. Doesn’t sound much like a comedy, right? This series is a great mix of black humor, hilarious moments, and well-presented characters. Again, in this series, simple language is used, so this is perfect for freshening up your Greek and having fun at the same time! As one of the most popular Greek TV series, we’re sure you’ll love it! Greek: Δε θα μου πεις εσύ πότε είναι η ώρα μου, εγώ θα σου πω πότε είναι η δική σου! Romanization: De tha mu pis esí póte íne i óra mu, egó tha su po póte íne i dikí su! 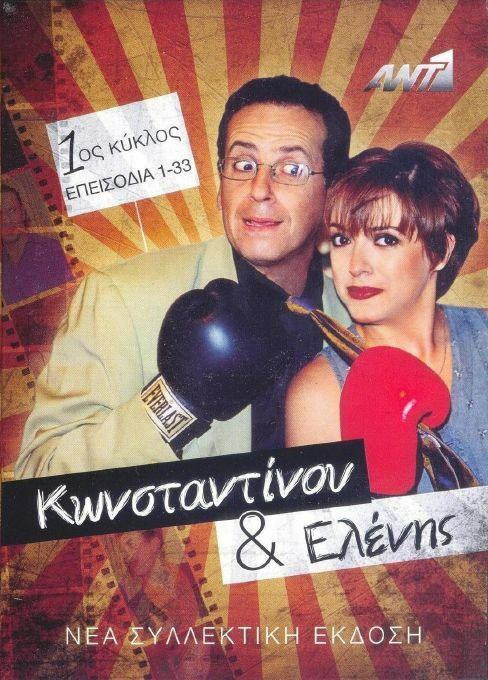 This may be one of the Greek TV shows most recently viewed. This comedy series is centered around the life of three couples. These are Nikiforos and Elisavet, Mimis and Xanthipi, and Pavlos and Irini. Things get hilariously perplexed when Pavlos begins an extramarital relationship with a young gymnast, Maria. In addition, the series also includes the relationships and interactions of these couples’ children. 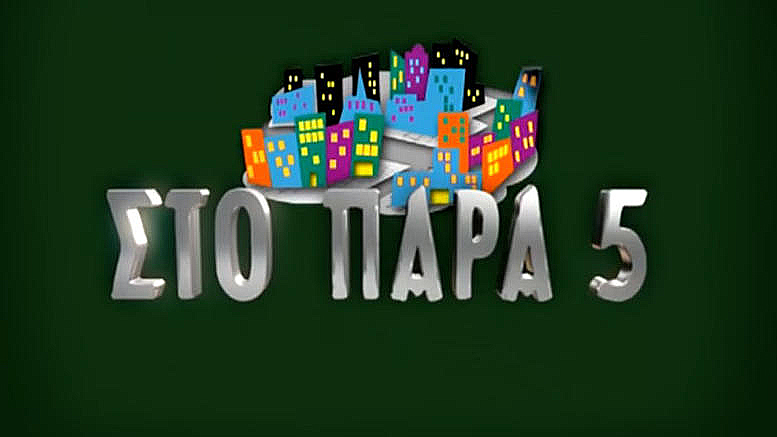 This is a typical and quite popular Greek TV series, which unfortunately was left unfinished, due to the bankruptcy of the Greek channel “Mega,” which was responsible for its production. The title of this Greek series refers to a Greek superstition. It’s believed that whoever is born on a Saturday is lucky and always get what they wish for. So if they wish for something, it will happen and that’s why they are considered lucky. If they wish someone harm, like a curse, it will also happen. So sometimes people born on a Saturday warn others to not mess with them because of that! Savvas is a rude, foul-mouthed, macho and misogynist womanizer. Therefore, he has been married three times. The title of the series refers to his three ex-wives Súla, Kéti, and Bía. When Savvas discovers while driving that he’s the lottery winner of 7.5-million euros, he’s involved in an accident which temporarily erases his memory. Having no one to care for him after the accident, his three ex-wives take pity on him and decide to help him recover. What will happen when they find out he’s the big winner of the Joker lottery? Watch this purely comedic series and find out! This is a pretty fun series to watch. However, fast speech is used as well as many idioms and slang words, mainly because one of the main characters (José) is an immigrant from Paraguay who strives to learn Greek. Greek: Κέρδισε 7.5 εκατομμύρια στο Τζόκερ. Romanization: Kérdise eptámisi ekatomíria sto Jóker. In a small and untouched Greek village, lives the great mayor Periandros Popotas who’s a really strict man, is really proud about the Greek legacy, and adores tradition and culture. Hara is a successful career-woman working for an advertising company in Athens. Sadly, almost simultaneously, she finds herself fired and inherits a house in the aforementioned conservative village, so she decides to move there with her daughter and open a cafe. Can the dynamic city girl Hara fit in inside this reclusive community? Watch and find out. This is probably the most successful Greek series of all time. It has been playing in repetition for over 15 years and it’s still played occasionally on Greek television. Konstantinos Katakouzinos is an assistant professor of Byzantinology at the University of Athens, whereas Eleni Vlahaki is a humble waitress at a bar. They’re sharing lodgings, living together in a mansion, after a legal problem. They’re two unrelated and very opposite characters, who tend to fight each other all the time. This Greek comedy series includes many slang words and phrases, so discretion is advised. Greek: Το σπίτι είναι δικό μου! Romanization: To spíti íne dikó mu! Based on the awarded book of Victoria Hislop, this story is set on Spinalonga, a small Greek island off the coast of Crete. The story focuses on a leper colony, which was established on the isolated island as a precaution measure. These people learned to live isolated from the whole world, with no doctors, doomed to suffer from this cruel disease. This is obviously a drama, which truly speaks to the soul. If you’re interested in how these people’s everyday life was, then this is the ultimate Greek TV show for you, especially if you plan on watching Greek drama TV series. This is a very successful Greek romantic comedy. Marina is one low-educated but ambitious young actress-hostess. When she decides to study acting she meets Konstantinos, a handsome and charming teacher of drama. However, he’s quite the opposite of her, being a well-educated and prestigious man. Their unconventional love story will certainly make you laugh and as you come to love them. Greek: Γύρνα πίσω ή έστω τηλεφώνα. Romanization: Gírna píso i ésto tilefóna. Set in a Greek female prison, this comedy has a unique concept. Sit back, relax, and watch the stories the prisoners unveil trying not to laugh out loud. When the charming male manager of the prison falls in love with one of the female prisoners, an interesting story begins. This series uses many slang words and phrases, so discretion is advised. This is a mystery-comedy-drama series, which revolves around five basic characters, who are initially unrelated. However, when they get trapped in a malfunctioning elevator, witnessing the death of a former minister, their fates are intertwined. Before passing away, the former minister mumbles, “Find the one who did this to me,” and so the adventure begins! This is a more contemporary Greek comedy, which is quite popular in Greece. The smart scenario and the totally different characters create a series to remember. If you’re into mystery, but can’t stand too much “darkness,” this is the series for you! Based on who you ask, this could be considered one of the most popular Greek soap operas. Greek: Για όλα φταίει η κοντή! Romanization: Ya óla ftéi i kondí. You might have noticed that most of these emblematic Greek series were produced before 2010. This is not something random, as the years after 2010 were really harsh on TV programs. By 2011, Greece was already deep into the worst economic recession of modern times. As a result, there were many cuts in the TV productions’ budgets and Greek channels preferred to buy the copyrights and show low-cost Turkish TV shows, instead of producing original Greek series. However, today all these TV shows have been digitized and are available through the development of technology and the world wide web. 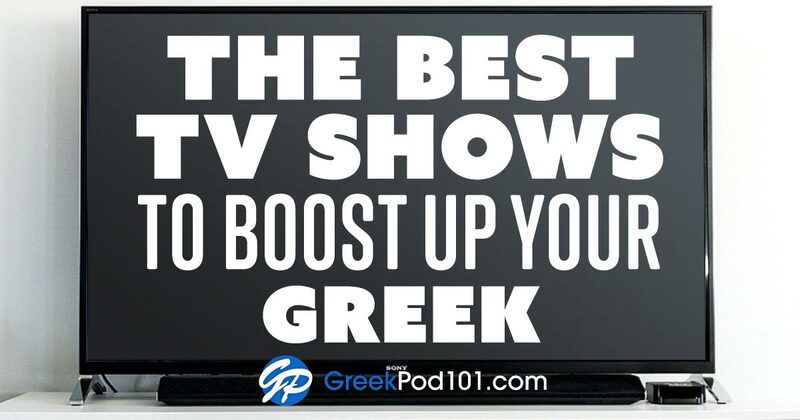 GreekPod101.com suggests watching the most popular TV shows of all time, as a fun and effective way to learn Greek. Do you want to learn more fun ways to effectively learn Greek? At GreekPod101.com, we aim to provide you with everything you need to know about the Greek language in a fun and interesting way. Articles like this one, word lists, grammar tips, and even YouTube videos are waiting for you to discover them! Also keep in mind that by utilizing our MyTeacher feature, you’ll gain access to one-on-one help as you learn the Greek language. You don’t want to miss out on this opportunity! How to Say Hello in Greek: Do it Like a Local! May Day (otherwise known as Labor Day, or Labor Day weekend in some places) has its roots in antiquity. Back then, the Greeks, as well as many other people of Europe, celebrated the final victory of spring against winter, something that would bring fertility and life to nature and, by extension, to humans. The word “May” itself is believed to have originated from the Roman goddess Maia, who took her name from Maia, one of the Pleiades. The word maia back then meant wet nurse and mother. The celebrations of antiquity were, of course, altered over time, but they survive today as simple folk traditions. Taking this historical context and examining it in light of more recent events and current traditions, you’ll uncover so much about Greece’s culture. Let GreekPod101.com show you everything you need to know about May 1 Day in Greece! May 1, otherwise known as Protomayá (”May Day”), is a holiday dedicated to spring and the flowers. It’s also called International Workers’ Day in memory of the uprising of the workers of Chicago on May 1886, who were demanding an eight-hour working schedule and better working conditions. For the labor unions, this is a day to strike, while for the rest it’s simply a public holiday. Thus, Labor Day’s meaning varies based on who you ask and who’s celebrating. Regardless, May Day in Greece is a day of historical significance and modern-day fun. 2. When is Labor Day? Each year, May 1st Day is celebrated on—May 1st! The perfect time of year to collect Greek flowers and observe the following Greek customs for May Day. 3. How is Labor Day Celebrated? How is May 1 celebrated in Greece? Read the Greek text below (and find the English translation directly below it) to learn about Greek customs during Protomagia. Στην Ελλάδα το πιο γνωστό έθιμο της Πρωτομαγιάς είναι το πρωτομαγιάτικο στεφάνι. Πολλοί εκμεταλλεύονται την αργία και πηγαίνουν εκδρομές στην ύπαιθρο για να μαζέψουν αγριολούλουδα και πρασινάδες, που θα πλέξουν σε στεφάνι και θα κρεμάσουν στις πόρτες τους απ’ έξω. Το έθιμο αυτό φέρνει τους ανθρώπους πιο κοντά στη φύση, ακόμα και όσους ζουν στις πόλεις. Το στεφάνι ξεραίνεται και παραμένει στις πόρτες ως τη γιορτή του Αϊ-Γιαννιού, όπου στην επαρχία το καίνε στις φωτιές που ανάβουν. Σε πολλές περιοχές ο Μάης ενσαρκώνεται στο «Μαγιόπουλο». Στο έθιμο αυτό ένα παιδί στολισμένο με λουλούδια τριγυρνάει στους δρόμους του χωριού μαζί με συνοδεία, και όλοι χορεύουν και τραγουδάνε τραγούδια για τον Μάη. Στη Ναύπακτο το Μαγιόπουλο συνοδεύεται από γέρους φουστανελάδες που κρατούν κουδούνια στολισμένα με ανθισμένη ιτιά. Το έθιμο αυτό, με ελάχιστες παραλλαγές, λέγεται «πιπεριά» στη βόρεια Εύβοια. Από τα χαράματα οι νέες του χωριού σκεπάζουν το σώμα μιας λυγερόκορμης κοπέλας με λουλούδια και φτέρες. Της κρεμάνε και ένα κουδούνι και αυτή είναι… η «πιπεριά». Σε μερικά μέρη όλοι καταβρέχουν την «πιπεριά» και τραγουδάνε παρακαλώντας για βροχή, ενώ εκείνη υποκλίνεται σε όσους τη ραντίζουν. Λένε πως πολλές φορές μετά το γύρισμα της «πιπεριάς» στους δρόμους του χωριού, βρέχει! In Greece, the most well-known tradition of May Day is the May Day wreath. Many people take advantage of this holiday and go on field trips in the countryside to collect wild flowers and greenery, which they will then weave into a wreath that they hang outside their doors. This tradition brings people closer to nature, even those who live in the cities. The wreath dries up and remains on the doors until the celebration of St. John, where in the province it is burned in the fires that people ignite. In many regions, May is personified with the May child. In this tradition, a child decorated with flowers wanders around the streets of the village with some escorts, and everyone dances and sings songs about May. In Nafpaktos, the May child is accompanied by elderly men who wear fustanela skirts and hold bells decorated with willow tree blossoms. This tradition, with a few variations, is called piperiá (”pepper tree̶ in north Euboea. From the crack of dawn, the young girls of the village cover the body of a tall and beautiful young girl with flowers and ferns. They also hang a bell on her, making her piperiá. In some places, everyone hoses down piperiá and sings pleas for rain, while she bows to those who sprinkle her. It’s said that very often after the stroll of piperiá on the streets of the village, it rains! Do you know when the first May Day protest in Greece was? It was in 1892 from the Central Socialist Association of Kallergis. Then another one followed the year after, with over 2,000 workers demanding an eight-hour working schedule, Sunday as a day off, and public health insurance for the victims of labor accidents. Nowadays on Protomagia, Greece holds protests, with the largest ones being in the center of Athens. Here’s some vocabulary you should know for May 1st Day in Greece! To hear the pronunciation of each word, check out our May 1st Day vocabulary list, where you’ll find each word accompanied by an audio file of its pronunciation. As you can see, May 1 is a day of great celebration across Greece, both rooted in history and blossoming in light of the modern world. What do you think about Greece’s celebration of May 1? Does your country have similar (or very different) celebrations? Let us know in the comments! To learn more about the culture of Greece and the Greek language, visit us at GreekPod101.com. We offer many tools to aid you in your language-learning journey, such insightful blog posts, an online community forum, and free vocabulary lists to expand your inner dictionary! You can also take advantage of our MyTeacher program to learn Greek with your own personal teacher. Know that your studying and practice will pay off, and you’ll soon be speaking Greek—and talking about its culture—like a native! Best wishes in your language-learning journey! 230 days of sunshine, more than 200 scenic, inhabited islands, welcoming faces of people, and a relaxed lifestyle. Sounds great, right? Well, you’ll be able to experience all of these and even more if you decide to find a job in Greece and stay for an extended period of time. Although Greece has gone through a vast economic recession, now it’s time for the country to flourish again. The government aims to encourage private investments and the demand for specialized employees has increased due to brain drain. In this article, GreekPod101.com will share with you everything you need to know about finding a job in Greece. Here are some useful tips and inside information, in order to get you ready for an amazing life experience. Once you’ve found out more about jobs in Greece for English speakers and how to get them, you’ll be all set. So let’s get started. When it comes to searching for a job in Greece, there are plenty of choices. Ten to twenty years ago, the best way to land a job in Greece was by searching through job ads published in local newspapers. Although there are still newspapers publishing job ads, the game has been shifted towards job hunting through the Internet. In this section, we’ll present you with the most popular ways to find yourself some job opportunities so that you can begin working in Greece. There’s a wide variety of international, as well as local, websites where you can browse through job ads. All of them are keyword-based, which means you’ll have to enter a keyword related to the job you’re looking for and search through the results. Other filters are also available such as region, years of experience, etc.. So without further ado, here are some of the top Greek job hunting websites. “Xe” stands for “Χρυσή Ευκαιρία (Hrisí Efkería)” which is translated in English to “Golden Opportunity.” Xe.gr is a popular choice amongst employers, as well as candidates. On this website you can find a wide variety of job ads for positions throughout Greece. Currently it’s only available in Greek; however, they plan on offering English content soon. 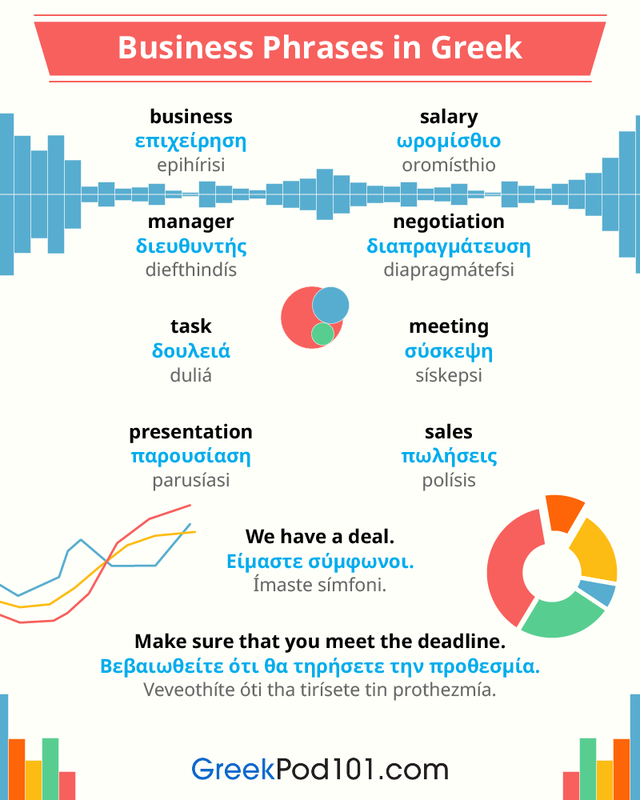 Pros: A popular website in Greece with many job ads throughout the country. Cons: Only available in Greek at the moment. Indeed is a leader in job hunting and it recently entered the Greek labor market. The user can browse through various job ads and a build-your-own-CV feature is also available. In addition, the CV can be sent directly to the company through the website. Pros: Easy to use and available in a variety of languages. Cons: Not very popular in Greece. If you know Greek at an advanced level, you’ll find the Greek version a bit odd. Localization didn’t go so well on that one. Καριέρα (Kariéra) in Greek is “Career” in English. This is a really popular website for finding job opportunities in Greece. Many national, as well as international, organizations based in Greece prefer posting their vacancies on this website. This website also supports creating and sending a CV directly to the company. Pros: Wide variety of job opportunities, mainly from large companies and organizations. Some ads are in English. Cons: Only available in Greek. Not many blue collar jobs available. This website is a member of the group The Network, a worldwide organization which has created 37 local websites in 37 different countries. Each website is well-adjusted to the characteristics of different labor markets, offering a fully localized experience. For example, while offering job advertisements through the Greek website, skywalker.gr also periodically publishes a newspaper—often inserted into popular national newspapers—in order to facilitate individuals who don’t have access to electronic services, or who prefer the old, traditional way of job hunting in Greece. Pros: Wide variety of job opportunities, mainly from large companies and organizations. Cons: Only available in Greek. Careerjet is a popular search engine for jobs. This website gathers job ads from many different websites. Its search engine nature provides an easy way to find a job, as it grants you access to a selection of websites and companies looking to hire new personnel. Pros: A wide variety of sources. This isn’t a very popular way to find a job in Greece amongst locals, though you can still give it a try. Just send your CV to a recruitment company with activity in Greece, and who knows? You might be able to find the job of your dreams. Most recruitment companies in Greece also offer selected job ads on their websites. A huge advantage of recruitment companies is that they can inform you about everything related to your new life in Greece. They often take care of any paperwork needed, as well. Contacting a recruitment company can also be beneficial if you don’t speak Greek at a conversational level, as it functions as a mediator between the candidate and the company. LinkedIn is the number one professional networking website in the world. For those who aren’t familiar with this special social network, the user is able to build a professional profile demonstrating all the important aspects of his career, as well as his skills, achievements, and professional experience. Basically, a personal LinkedIn profile functions as an electronic Curriculum Vitae. However, LinkedIn also provides online job ads. Organizations, recruitment companies, and independent headhunters use this platform in order to find the most appropriate employee for a given job vacancy. In Greece, over the past few years, the importance of LinkedIn has been highlighted. More and more companies are using it in order to find the perfect employee or even to simply widen their search. Nevertheless, LinkedIn is merely used in order to find highly specialized personnel. Publicize your interest in finding a job in Greece. Do you have friends or relatives in Greece? Just talk to them. Word-of-mouth personal branding is one of the most effective ways to get you the job you want. Greeks are quite communicative and helpful—it’s not a coincidence that they’re famous for their hospitality. Another way is to start sending your CV to companies based in Greece, that you ideally want to work for, regardless of the job ads you might find. Every well-established company will take into account a prestigious CV, even if there aren’t any vacancies at the moment. Last but not least, if you’re already in Greece, don’t be shy. It’s common for people looking for a job to visit shops and leave a CV just in case. You can start by strolling around your neighborhood. Who knows? A good job opportunity might be around the corner. The knowledge of a foreign language at a native speaker level has always been a huge advantage in the Greek labor market. So, which jobs are the most popular amongst foreigners in Greece? Greece is a popular tourist destination, and offering information and services in the traveller’s native language just takes customer service to another level. Therefore, the Greek tourism industry is in high need of foreign employees. There’s a huge demand for Scandinavian, Russian, German, Spanish, and Italian speakers. Indeed, knowledge of Greek is often not required, but knowledge of English, along with your native language, is totally a must. Tourism-related jobs are often available at the beginning of each summer season, which in Greece is pretty early, around mid-March or April, till the end of October. In addition, this category of jobs is in high demand on Greek islands and other popular tourist destinations, so many foreigners prefer them, as they combine holidays on sandy beaches with work. Another popular choice for foreigners is teaching their native language. In Greece there are many private educational organizations, where languages from all over the world are taught. In this case, a teaching degree is often needed. In addition, if you aim to teach young children, a conversational level of Greek language is almost a prerequisite. However, when it comes to teaching adults, knowledge of the English language along with your native language can also work, as adults in Greece have a really good knowledge of English. This allows you to explain everything in English. Greece might be a well-developed country, but the recent economic crisis didn’t allow technology to drastically enter the everyday lives of its citizens until recently. Therefore, now, e-commerce, mobile app development, and electronic transactions have begun to flourish. This has led to an increase in the demand for technology-related professions. Foreigners have equal opportunities with locals and in many cases a knowledge of Greek isn’t mandatory. The procedure of finding a job in Greece is pretty much the same as in any other country. In order to search for a job, a well-written CV is a must. In Greece, a Europass template is quite popular and happily accepted. A motivation (or cover) letter isn’t required most of the time, as only multinational companies based in Greece might ask for one. By the end of the selection process, the company contacts all shortlisted candidates, usually through phone, and arranges an interview. The interview is quite typical compared to other European countries. You might be asked to talk a little bit about yourself and your professional experience. Some large organizations or recruitment companies might put you through a skills test, which will complement the interview procedure, but there’s no standard here. 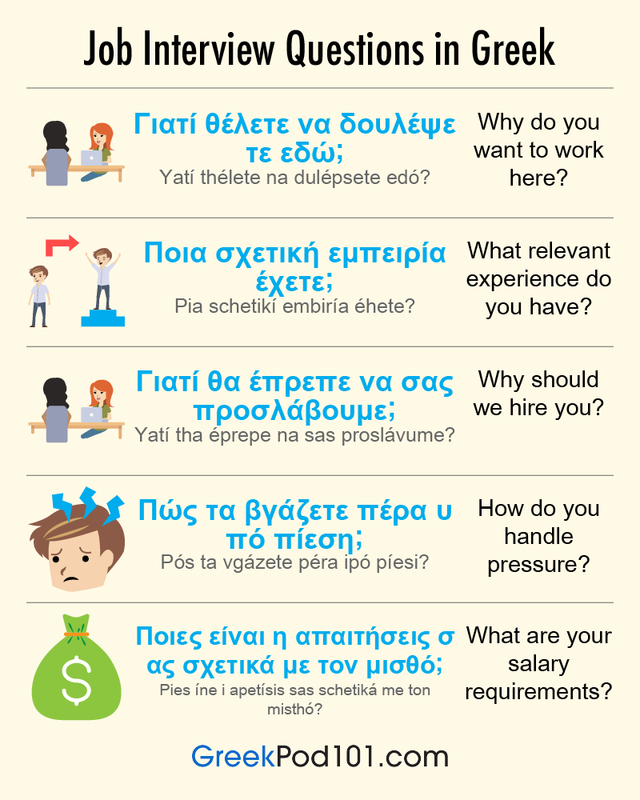 Hopefully these Greek CV tips and interview information will help you be your best for the best job out there! Lastly, in order to be able to work legally in Greece, you’ll have to find an employer who will grant you with a work invitation. In this way, you can get a working VISA in Greece, which should be renewed every year. Working and living in Greece will be a breeze for you with your VISA. As you can see, in Greece you can find a job even without speaking the language. Nevertheless, you’ll be able to find a better job if you do speak Greek. In addition, speaking Greek will make your stay and everyday life in Greece much easier. Start learning Greek today with GreekPod101.com and prepare yourself and the future of your career! You can also visit the My teacher Page, where you can get in touch with our Greek teacher, discuss your needs, and start learning Business Greek. Clean Monday (also known as Kathari Deftera or Καθαρά Δευτέρα) is a religious holiday in Greece, and marks the beginning of Lent. This is a holiday of great importance in the country, is a strong representation of what Christianity looks like in Greece, and provides a lot of important cultural insight. Let GreekPod101.com guide you through all the facets of Ash Monday. This way, you can learn the Greek language in context, and gain much knowledge concerning the country and its people. Let’s get started! 1. What is Clean Monday in Greece? Clean Monday is a particularly popular celebration. It is called Clean because on this day the Lent fast that cleanses the Christians spiritually and physically begins, while it is also the end of the frenzied celebrations of the Triodion. Clean Monday is a public holiday, so families take the opportunity to gather and celebrate the beginning of Lent together, 48 days before Easter. 2. When is Clean Monday? 3. Reading Practice: How is Clean Monday Celebrated? Read the Greek text below to learn how Greeks celebrate Clean Monday! You can find the English translation directly below it. Για τους περισσότερους η Καθαρά Δευτέρα σημαίνει εκδρομές στην ύπαιθρο, πέταγμα χαρταετού, παραδοσιακή μουσική και φαγοπότι με νηστίσιμα φαγητά όπως η λαγάνα, ο ταραμάς, ο χαλβάς, η φασολάδα και τα καλαμαράκια. Η λαγάνα είναι ένα είδος επίπεδου άζυμου ψωμιού πασπαλισμένο με σουσάμι. Όσον αφορά τους χαρταετούς, παλιότερα οι άνθρωποι τους κατασκεύαζαν μόνοι τους με καλάμια και χαρτί. Επειδή όμως αυτό θέλει μαστοριά στο ζύγισμα για να μπορέσει να πετάξει ο χαρταετός, σήμερα οι περισσότεροι αγοράζουν έτοιμους. Τα έθιμα της καθαροδευτεριάτικης αυτής εξόδου λέγονται «κούλουμα». Σε πολλές περιοχές της Ελλάδας τα κούλουμα γιορτάζονται με διαφορετικούς τρόπους. Για παράδειγμα στο Γαλαξίδι η Καθαρά Δευτέρα μόνο «καθαρή» δεν είναι, καθώς από το μεσημέρι και μετά λαμβάνουν χώρα τα διάσημα «αλευρομουτζουρώματα». Εκατοντάδες κάτοικοι και επισκέπτες συγκεντρώνονται στο λιμάνι όπου και διεξάγεται ένας απίστευτος πόλεμος με τόνους από αλεύρι, φούμο και λουλάκι. Τα κυνηγητά και τα πειράγματα συνεχίζονται μέχρι το σούρουπο. Το έθιμο αυτό είναι αρκετά διασκεδαστικό, αρκεί να τηρούνται οι απαραίτητες προφυλάξεις όπως η χρήση προστατευτικών γυαλιών, μάσκας και κατάλληλων ρούχων. Πολλά έθιμα αυτή την ημέρα αναβιώνουν το θέμα του γάμου. «Του Κουτρούλη ο Γάμος» στη Μεθώνη ήταν ένας πραγματικός γάμος που άφησε εποχή τον 14ο αιώνα. Στη Θήβα ο «Βλάχικος γάμος», που έχει ήδη ξεκινήσει από την Τσικνοπέμπτη, κορυφώνεται με το ξύρισμα του γαμπρού και το στόλισμα της νύφης, η οποία στη πραγματικότητα είναι άντρας! Γενικά σ’ όλη την Ελλάδα πολλοί δήμοι προσφέρουν δωρεάν λαγάνες, φασολάδα, χαλβά και ελιές, όπως κάνει κάθε χρόνο ο Δήμος Αθηναίων στον Λόφο Φιλοπάππου και στο Άλσος Βεΐκου. Η δωρεάν προσφορά φαγητού στις καθαροδευτεριάτικες εκδηλώσεις προσελκύει κάθε χρόνο μεγάλο αριθμό κόσμου, με αποτέλεσμα να δημιουργούνται τεράστιες ουρές στους πάγκους και να εξαντλούνται οι μερίδες μέσα σε πολύ λίγη ώρα. For most people, Clean Monday means excursions in the countryside, flying a kite, traditional music, and a feast with fasting foods such as lagana bread, taramas (salted and cured cod roe), halva, bean soup, and squid. Lagana is a type of flat unleavened bread sprinkled with sesame seeds. Regarding the kites, in the old days, people used to make them by themselves with reeds and paper. But because this requires good craftsmanship in the weighting so that the kite can fly, today most people buy ready-made ones. The customs of this Clean Monday outing are called koulouma. In many areas of Greece, koulouma are celebrated in different ways. For example in Galaxidi, Clean Monday is anything but clean, as from noon and beyond, the famous flour fights take place. Hundreds of residents and visitors gather at the harbor, where an incredible war is performed with tons of flour, soot, and indigo. All the chasing and teasing continues until dusk. This custom is quite fun, as long as the necessary precautions are taken, such as the use of protective goggles, a mask, and suitable clothing. Many traditions on this day revive the concept of marriage. Koutrouli’s wedding in Methoni was a real marriage that made history in the 14th century. In Thebes the Vlach wedding, which has already started from Fat Thursday, culminates with the shaving of the groom and the dressing of the bride, who in reality is a man! Generally all over Greece, many municipalities offer free lagana bread, bean soup, halva, and olives, just like the municipality of Athens does every year on the Filopappou Hill and the Veikou Park. The offer of free food during the festivities of Clean Monday attracts a large number of people every year, resulting in long queues at the stalls and the depletion of the portions within a very short time. There is also another variation on why we characterize this day as Clean. Do you know which one it is? The other version is that Clean Monday was named this way because in the old days the housewives used to wash their cooking utensils all day long after the feast of the carnival. Clean Monday meals may be delicious, but you can imagine the mess they leave behind on cookware! 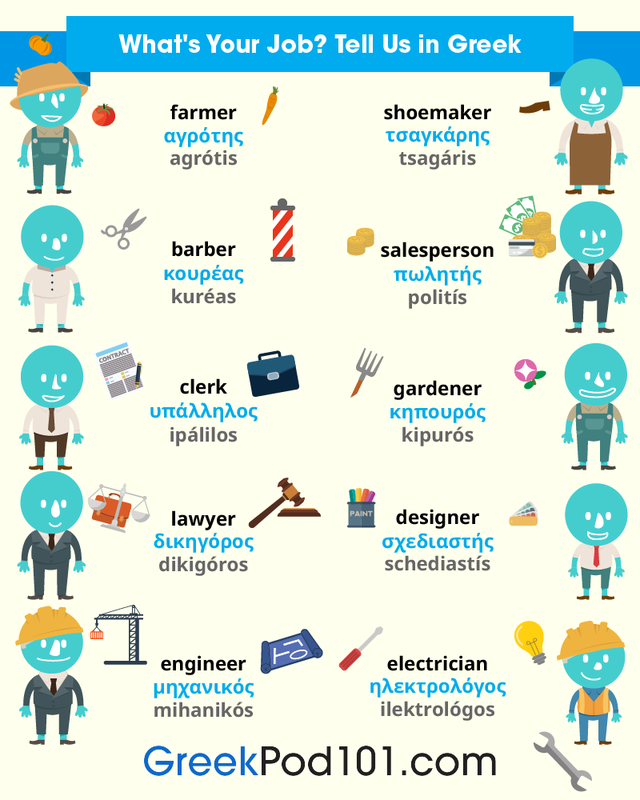 Here’s some vocabulary you should know to celebrate Clean Monday in Greece! To hear each of these vocabulary words pronounced, check out our Greek Clean Monday vocabulary list. Here you’ll find each word accompanied by an audio of its pronunciation. Now you know more about Clean Monday in Greece. What do you think of this holiday? Is there a similar celebration in your own country? Let us know in the comments! To learn even more about Greek culture and the language, visit us at GreekPod101.com! We offer an array of insightful blog posts, free vocabulary lists, and even an online community to discuss lessons with fellow Greek learners! You can also check out our MyTeacher program if you’re interested in pursuing a one-on-one learning experience with your own personal Greek teacher. We hope you enjoyed learning about Greek Clean Monday and that you took away something valuable from this lesson. Know that all of your studying and hard work will pay off, and you’ll be speaking like a Greek native before you know it! Fat Thursday is one of many Greek holidays where heavy feasting takes place. This religious Greece holiday, also called Tsiknopempti, is important for you to get to know so that you can better understand Greek culture. Here at GreekPod101.com, it’s our goal to help you delve deep into the Greek culture and language, both efficiently and in a fun manner. So, let’s go ahead and start learning about what Fat Thursday in Greece really looks like. 1. What is Fat Thursday in Greece? Fat Thursday, or Τσικνοπέμπτη (Tsiknopémpti), is traditionally a day where grilled meat is consumed in large quantities. If you find yourself in Greece on Fat Thursday, you won’t be able to mistake what day it is, because the smell of burning fat being roasted on grills is everywhere! The event is celebrated 59 days before Easter, or Πάσχα. Essentially, Fat Thursday is a “last chance” of celebration and rowdiness before Easter. This is because the Lent holiday is nearby, which is a time of fasting and abstinence from all those things which will be enjoyed on Fat Thursday. The origin of Fat Thursday is not verified, but it’s thought that it comes from the Dionysian and bacchanal festivals of the ancient Greeks and Romans. This is why many special events are often accompanied by mocking songs, teasing, speaking in a vulgar manner, and sexual innuendo. In many regions, pigs, or χοίροι, are slaughtered, while outdoor grills are set up everywhere from early in the morning, continuously churning out exquisite tidbits, or Μεζές (mezés), and traditional skewered meat. There is plenty of meat eating, or Κρεοφαγία (kreofayía), and wine drinking, or Οινοποσία (inoposía), on this day, as it’s the last chance for rowdiness and meat consumption before Lent, or Σαρακοστή, the period of fasting. After Fat Thursday, the next opportunity for partying doesn’t occur until Easter, a whole 59 days later, which is why Greeks put so much effort into making it an enjoyable event. Read the Greek text below to find out about this fun custom (you can find the English translation below it). Η έννοια του γάμου συναντάται σε πολλά έθιμα, όπως αυτό της «Κουλουρούς» στην Πάτρα. Η Γιαννούλα η κουλουρού ντύνεται νύφη και πηγαίνει στο λιμάνι να προϋπαντήσει τον Αμερικανό πρόεδρο Ουίλσον πιστεύοντας, λανθασμένα, πως την αγαπά και θέλει να την παντρευτεί. Ο κόσμος που τη συνοδεύει διασκεδάζει με τα καμώματά της. Στη Θήβα επίσης, την Τσικνοπέμπτη αρχίζει ο περίφημος «βλάχικος γάμος» που βασίζεται στο προξενιό δύο νέων, και ολοκληρώνεται την Καθαρά Δευτέρα. Τέλος στις Σέρρες ανάβονται μεγάλες φωτιές. Αφού ψήσουν το κρέας, οι άνθρωποι πηδούν από πάνω τους. The concept of marriage is found in many traditions, such as that of the Koulourou (bagel saleslady) in Patras. Giannoula, who sells bagels, dresses up as a bride and goes to the harbor to meet and welcome the American president Wilson believing, mistakenly, that he loves her and wants to marry her. The people that accompany her are being entertained with her behavior. In Thebes also, on Fat Thursday the famous Vlach wedding begins, which is based on the matchmaking of two young people, and ends on Clean Monday. Finally, in Serres, large fires are being lit. After they roast the meat, people jump over them. The incident of Giannoula, the bagel saleslady, did happen before the second World War. Since the prank that was played on this naive woman caused so much laughter, the show was repeated for several years, so it ended up becoming a custom. Why do Greek people eat meat on Thursday, as you see in the name Fat Thursday, as opposed to other weekdays? For the Orthodox Church, or Ορθόδοξη Εκκλησία, the fasts of Wednesday and Friday are important. Because Thursday lies between these two days, it is considered the most suitable day for revelry. To hear the pronunciation of each word, visit our Greek Fat Thursday vocabulary list. Here, you’ll find an audio of each pronunciation alongside the word. Now you know more about how Greeks celebrate Fat Thursday. What do you think about this holiday? Does your country celebrate Fat Thursday or a similar holiday? Let us know in the comments! To learn more about Greek culture and the language, visit us at GreekPod101.com. We offer an array of insightful blog posts, free vocabulary lists, and an online community where you can discuss lessons with fellow Greek students. You can even download our MyTeacher app for a one-on-one learning experience with your own personal Greek teacher. We hope you enjoyed learning about Greek Fat Thursday with us! Stay tuned for more Greek holiday articles, and keep up the good work. You’ll be a master of the Greek language before you know it! Do you often feel lonely and sad? Do you long for romance and are willing to do whatever it takes to meet that special person? Speaking another language could revolutionize your love life! So, why wait? Learning how to say ‘love’ in Greek could be just what you need to find it. Or perhaps you were lucky, and have found your Greek partner already. Fantastic! Yet, a cross-cultural relationship comes with unique challenges. Learning how to speak your lover’s language will greatly improve your communication and enhance the relationship. At GreekPod101, our team will teach you all the words, quotes and phrases you need to woo your Greek lover with excellence! Our tutors provide personal assistance, with plenty of extra material available to make Greek dating easy for you. Will Falling in Love Help You Learn Greek Faster? So, you have met your Greek love interest. Congratulations! Who knows where this could take you…?! However, the two of you have just met and you’re not ready to say the Greek word for love just yet. Great, it is better to get to know him/her first. 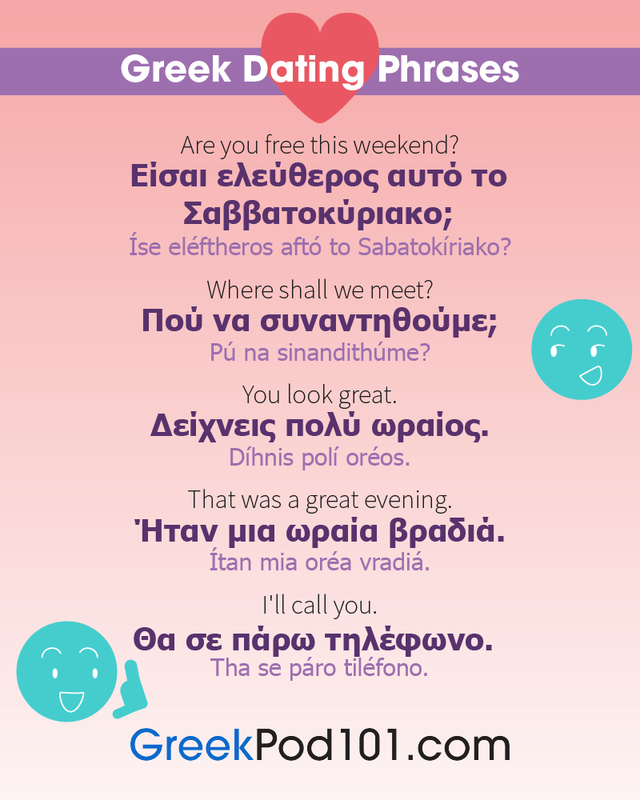 Wow your prospective love by using these Greek date phrases to set up a spectacular first date. Tha ítheles na vgúme éxo ya dípno? The important question! In most cultures, this phrase indicates: ‘I’m romantically interested in you’. Flirting in Greek is no different, so don’t take your date to Mcdonald’s! Íse eléftheros aftó to Sabatokíriako? Ti óra na sinandithúme ávrio? Ti gnómi éhis yi’ aftó to méros? This another good conversation starter. Show off your Greek language skills! Thes na páme kápu alú? Póte boró na se xanadó? You learned all the Greek phrases to make a date - congratulations! Now you have to decide where to meet, which can be tricky. Discuss these options with your lover to gauge whether you like the same things. Check out romantic date ideas in Greek below! Expressing your feelings honestly is very important in any relationship all year round. Yet, on Valentine’s Day you really want to shine. Impress your lover this Valentine’s with your excellent vocabulary, and make his/her day! We teach you, in fun, effective ways, the meanings of the words and how to pronounce them. 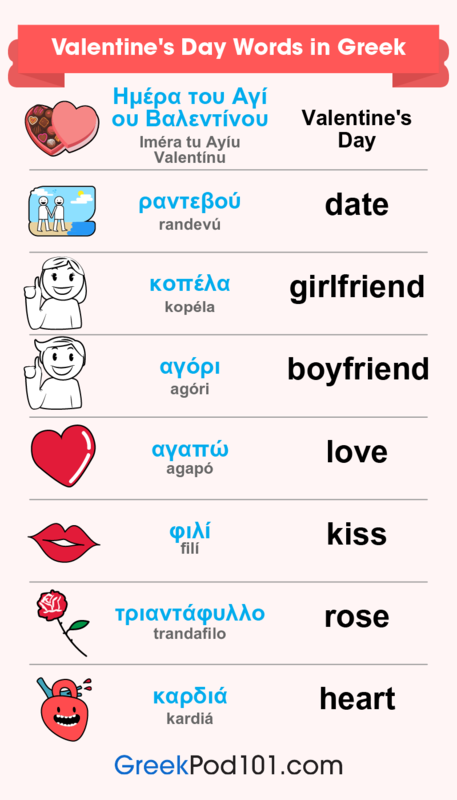 You can also copy the characters and learn how to write ‘I love you’ in Greek - think how impressed your date will be! So, you now have the basic Valentine’s Day vocabulary under your belt. Well done! But, do you know how to say ‘I love you’ in Greek yet? Or perhaps you are still only friends. So, do you know how to say ‘I like you’ or ‘I have a crush on you’ in Greek? No? Don’t worry, here are all the love phrases you need to bowl over your Greek love on this special day! Saying ‘I love you’ in Greek carries the same weight as in all languages. Use this only if you’re sure and sincere about your feelings for your partner/friend. Siménis tósa polá ya ména. Thes na yínis o Valentínos mu? If you don’t know how to say ‘You’re pretty’ in Greek, this is a good substitute, gentlemen! Σε βλέπω σαν κάτι παραπάνω από φίλο. Se vlépo san káti parapáno apó fílo. Say this if you are not yet sure that your romantic feelings are reciprocated. It is also a safe go-to if you’re unsure about the Greek dating culture. Εκατό καρδιές θα ήταν πολύ λίγες για να κρατήσουν όλη την αγάπη μου για σένα. Ekató kardiés tha ítan polí líyes ya na kratísun óli tin agápi mu ya séna. Η αγάπη είναι απλώς αγάπη. Δεν μπορεί να εξηγηθεί ποτέ. I agápi íne aplós agápi. Den borí na exiyithí poté. Ladies, this phrase lets your Greek love know how much you appreciate his looks! Don’t be shy to use it; men like compliments too. Με κάνεις να θέλω να γίνω καλύτερος άνθρωπος. Me kánis na thélo na yíno kalíteros ánthropos. Gentlemen, don’t claim this phrase as your own! It hails from the movie ‘As Good as it Gets’, but it is sure to make your Greek girlfriend feel very special. Let her know that she inspires you! Όλα όσα λέγετε και κάνετε ας γίνονται με αγάπη. Óla ósa léyete ke kánete as yínonde me agápi. Είσαι το φως μου, αγάπη μου. Íse to fos mu, agápi mu. Οι λέξεις δεν μπορούν να περιγράψουν την αγάπη μου για σένα. I léxis den borún na perigrápsun tin agápi mu ya séna. Ήταν γραφτό να είμαστε μαζί. Ítan graftó na ímaste mazí. Αν σκεφτόσουν κάποιον ενώ διάβαζες αυτό, τότε είσαι σίγουρα ερωτευμένος. An skeftósun kápion enó diávazes aftó, tóte íse sígura erotevménos. You’re a love champ! You and your Greek lover are getting along fantastically, your dates are awesome, your Valentine’s Day together was spectacular, and you’re very much in love. Good for you! Here are some beautiful phrases of endearment in Greek that will remind him/her who is in your thoughts all the time. Wow. Your Greek lover is indeed the love of your life - congratulations! And may only happiness follow the two of you! In most traditions, the man asks the woman to marry; this is also the Greek custom. Here are a few sincere and romantic lines that will help you to ask your lady-love for her hand in marriage. Απλά δεν είμαι έτοιμη για μια τέτοιου είδους σχέση. Aplá den íme étimi ya mia tétiu ídus schési. 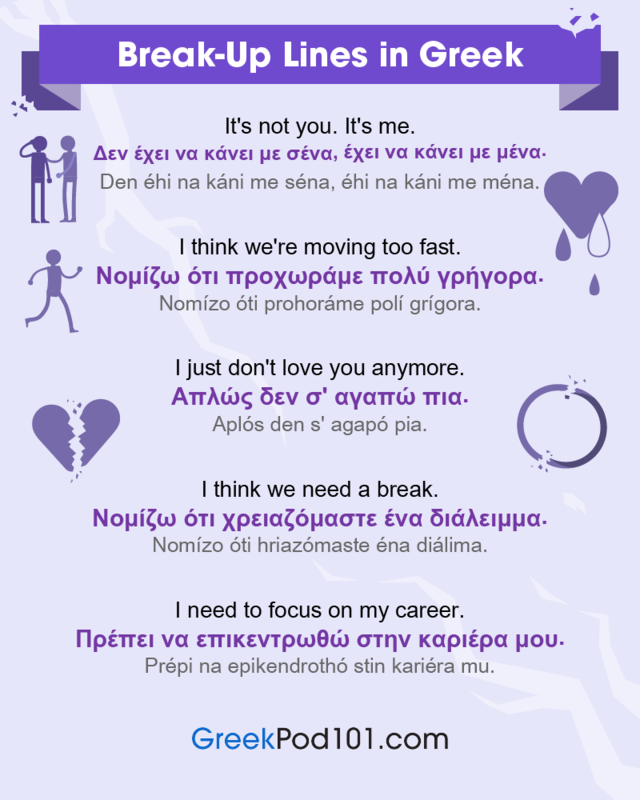 If the relationship was very intense, and you have sent many ‘i love u’ texts in Greek, this would not be a good breakup line. Feelings need to calm down before you can be friends, if ever. If the relationship has not really developed yet, a friendship would be possible. Νομίζω ότι χρειαζόμαστε ένα διάλειμμα. Nomízo óti hriazómaste éna diálima. Νομίζω ότι προχωράμε πολύ γρήγορα. Nomízo óti prohoráme polí grígora. Πρέπει να επικεντρωθώ στην καριέρα μου. Prépi na epikendrothó stin kariéra mu. Δεν είμαι αρκετή για σένα. Den íme arketí ya séna. Απλώς δεν σ’ αγαπώ πια. Aplós den s’ agapó pia. Απλώς δεν είμαστε ο ένας για τον άλλον. Aplós den ímaste o énas ya ton álon. Έχουμε απομακρυνθεί ο ένας απ’ τον άλλον. Éhume apomakrinthí o énas ap’ ton álon. Δεν έχει να κάνει με σένα, έχει να κάνει με μένα. Den éhi na káni me séna, éhi na káni me ména. As long as you mean it, this can be a kind thing to say. It means that there’s nothing wrong with your Greek lover as a person, but that you need something different from a relationship. Πρέπει να αρχίσουμε να βγαίνουμε με άλλους. Prépi na arhísume na vyénume me álus. 8. Will Falling in Love help you Learn Greek faster? Most people will agree that the above statement is a no-brainer - of course it will! Your body will be flooded with feel-good hormones, which are superb motivators for anything. GreekPod101 is one of the best portals to help help make this a reality, so don’t hesitate to enroll now! Let’s quickly look at the reasons why falling in love will speed up your learning of the Greek language. 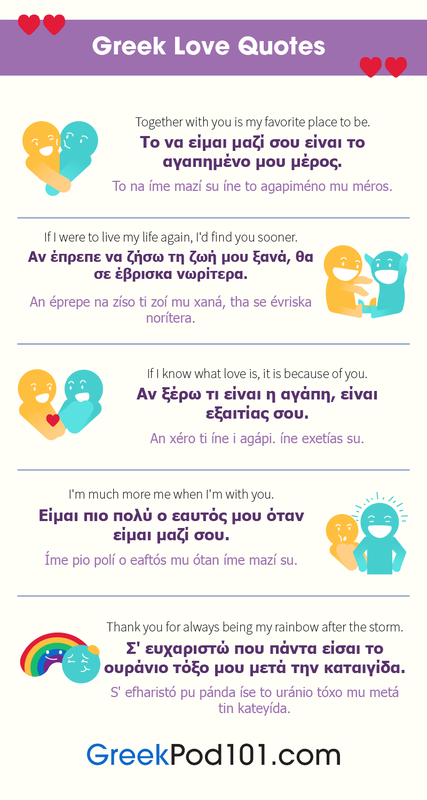 Three Reasons Why Having a Lover will Help you Learn Greek Faster! 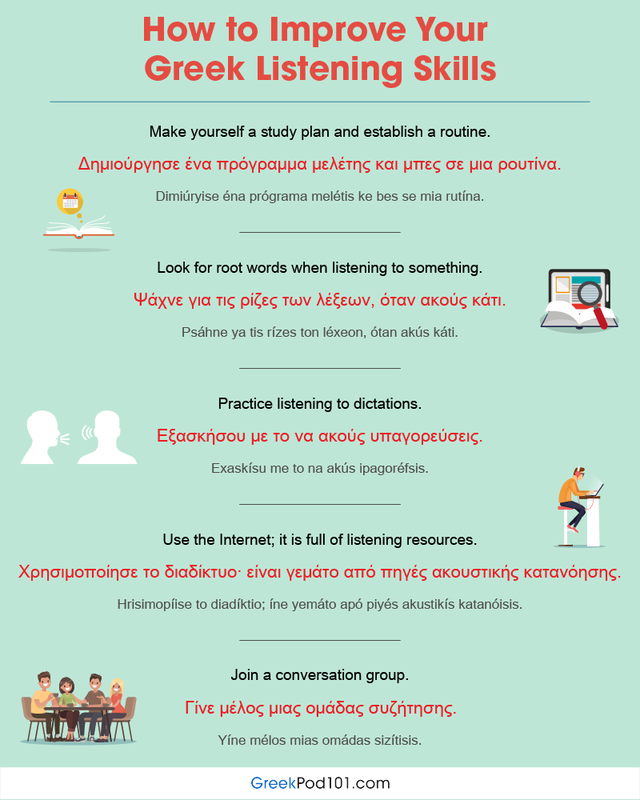 GreekPod101 uses immersive methods and tools to teach you Greek, but having a relationship with a native speaker will be a very valuable addition to your learning experience! You will gain exposure to their world, realtime and vividly, which will make the language come alive even more for you. The experience is likely to expand your world-view, which should motivate you to learn Greek even faster. Nothing beats continuous practice when learning a new language. Your partner will probably be very willing to assist you in this, as your enhanced Greek language skills will enhance the relationship. Communication is, after all, one of the most important pillars of a good partnership. Also, you will get to impress your lover with the knowledge gained through your studies - a win/win situation! 3- A supportive Greek lover is likely to make a gentle, patient teacher and study aid! With his/her heart filled with love and goodwill for you, your Greek partner is likely to patiently and gently correct your mistakes when you speak. This goes not only for grammar, but also for accent and meaning. With his/her help, you could sound like a native in no time! Falling in love with a man or woman speaking Greek is an opportunity for both of you to learn a new language! For this reason, every lesson, transcript, vocabulary list, and resource at GreekPod101 is translated into both English and Greek. So, while your partner can help you learn Greek faster, you can potentially also help him/her learn and master English! At GreekPod101, our focus is to help our students learn practical vocabulary and phrases used by everyday people in Greece. This means that, from your very first lesson, you can apply what you learn immediately! So, when your Greek partner wants to go out to a restaurant, play Pokemon Go, or attend just about any social function, you have the vocabulary and phrases necessary to have a great time! 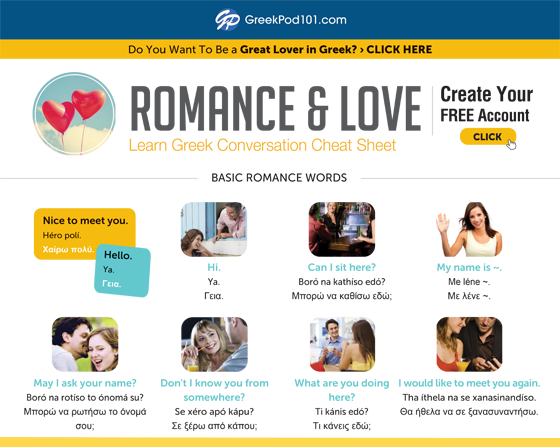 You now have access to GreekPod101’s specially-developed sections and tools to teach you love words, phrases, and cultural insights to help you find and attract your Greek soul mate. A personal tutor will assist you to master these brilliantly - remember to invite him/her to your wedding! Can You Really Learn Greek Alone? Don’t worry, not only is it possible to learn Greek or any language without traditional classroom instruction: GreekPod101 has created the world’s most advanced and extensive online language learning system. Not only is GreekPod101 specifically designed to help you with learning a language on your own, it’s actually faster, more convenient, and less expensive than traditional classroom options! Let’s look at some of the benefits of learning Greek or any language alone. In today’s fast-paced world, there just isn’t time for traditional classroom instruction. Between getting to class and studying on some professor or teacher’s schedule, traditional classroom learning is simply impossible to fit in. But when you learn Greek alone, you can study in bed if you like and whenever suits your schedule best, making it far easier to actually reach your goal of learning and mastering the language. Speaking in front of a class, pop quizzes, and tests are just a few of the stressors you will encounter when you learn a language in a traditional classroom setting. Specifically, these are external stressors that often derail most people’s dream of learning a new language. But when you learn Greek alone, there are no external stressors. Without the external stress and anxiety, it becomes much easier and more exciting to study Greek and reach your very own goals—all on your own! The best way to learn a language on your own is to study from native speaking instructors. Ideally, you want audio and/or video lessons that teach vocabulary, grammar, and provide actual Greek conversations and dialogue to help you with pronunciation. GreekPod101 has hundreds of hours of HD audio and video lessons created by real Greek instructors and every lesson is presented by professional Greek actors for perfect pronunciation. Plus, all lessons can be accessed 24/7 via any mobile device with Internet access. And, if you download the PDF versions of each lesson, you can even study without Internet access once the lesson is stored on your device! Although GreekPod101 has more than thousands of video and audio lessons, you need not review each and every one to learn the language. In fact, GreekPod101 has developed a feature called “Learning Paths”. You simply tell us your goals and we will identify the best courses and study plan to help you reach them in the shortest time possible. So even though you are technically learning a language on your own, our team is always here to help and make sure you reach your goals FAST! Armed with our growing collection of advanced learning tools, it’s truly a breeze to learn Greek alone and reach your goals! Learning a language on your own is not only possible, it’s actually easier and more beneficial for you than traditional classroom instruction. In fact, when you learn Greek on your own you can study at your own pace, eliminate stress, and actually increase cognitive function. GreekPod101 is the world’s most advanced online language learning system and a great resource to help you teach yourself a new language. With the world’s largest collection of HD audio and video lessons, more than 20 advanced learning tools, and customized “Learning Paths”, GreekPod101 makes learning a new language easier, more convenient, and less expensive than traditional classroom instruction. And the best part is: With GreekPod101, you can study in bed, your car, or wherever you have a few spare minutes of time. Create your Free Lifetime Account now and get a FREE ebook to help “kickstart” your dream of learning a language on your own below! Yes, even beginners can quickly learn conversational Greek well enough to carry on real conversations with native speakers. Of course, beginners won’t be able to carry a conversation the same way they could in their native language. But, just knowing a few tips like which questions to ask to keep a conversation going are all you need to speak and interact with real native speakers! But before we get to specific suggestions, let’s first take a closer look at how having real Greek conversations is so vital to your mastery of the language. Communicating with other people is the very point of language and conversation is almost second nature in our native tongue. For beginners or anyone learning a new language, conversations aren’t easy at all and even simple Greek greetings can be intimidating and awkward. Master the Language Faster: Nothing will help you learn to speak Greek faster and truly master the language than having real conversations with native speakers. Conversations quickly expose you to slang, cultural expressions, and vocabulary that force you to absorb and assimilate information faster than any educational setting—and that’s a great thing! But how can you possibly have real conversations with real Greek people if you are just starting out? For beginners and even more advanced speakers, the key is to learn to ask questions to keep a conversation going. Of course, they can’t be just random questions or else you may confuse the listener. But, by memorizing a few key questions and the appropriate time to use them, you can easily carry a conversation with minimal vocabulary or experience. And remember, the more Greek conversations you have, the quicker you will learn and master the language! You don’t need to memorize 10,000’s of words to learn conversational Greek. In fact, with just a couple hundred Greek words you could have a very basic Greek conversation. And by learning maybe 1,000-2,000 words, you could carry a conversation with a native speaker about current events, ordering in restaurants, and even getting directions. If you want to know how to carry a conversation in Greek, then you need exposure to native speakers—and the more the better. Ideally, studying video or audio lessons is ideal because they provide contextualized learning in your native language and you can play them again and again until mastery. The Largest Collection of HD Video & Audio Lessons from Real Greek Instructors: GreekPod101 instructors have created hundreds of video and audio lessons that you can play again and again. And the best part is: They don’t just teach you Greek vocabulary and grammar, they are designed to help you learn to speak Greek and teach you practical everyday topics like shopping, ordering, etc! 2000 Common Greek Words: Also known as our Core List, these 2,000 words are all you need to learn to speak fluently and carry a conversation with a native speaker! Although it may seem intimidating for a beginner, the truth is that it is very easy to learn conversational Greek. By learning a few core vocabulary terms and which questions to ask to keep a conversation going, just a little practice and exposure to real Greek conversations or lessons is all it really takes. GreekPod101 has created the world’s largest online collection of video and audio lessons by real instructors plus loads of advanced tools to help you learn to speak Greek and carry a conversation quickly. Today, classrooms are no longer the only or even best place to learn a new language like Greek. More and more people are finding that they can easily learn a language just about anywhere they have a few minutes of spare time, including their daily commute to work. According to the U.S. Census Bureau, the average American spends over 50 minutes a day commuting to and from work, or over 300 hours a year. But rather than simply sitting in traffic and wasting the time, you can instead use your daily commute to literally learn Greek in just a few short months! GreekPod101 has developed specialized learning tools that you can use on your commute to work (and home again) to master the language in your spare time. Keep reading to learn how to get your free audiobook to use on your next commute so you can see for yourself how easy it is to transform “dead time” into realizing your dream of learning a new language! Not sure if it’s practical to learn another language while commuting to and from work each day? Well not only is it possible—learning in your car on the way to and from work each day can actually help you learn and master Greek or any language much faster! The simple truth is that repetition is absolutely vital to truly internalizing and mastering any language. So, if you listen to audiobooks or even audio lessons on your commute to work and then repeat the same lesson on your commute home, the information is more likely to be “locked-in” to your long-term memory! Every single week, GreekPod101 creates new audio lessons by native speaking instructors. All lessons are short, to the point, and guaranteed to improve your mastery of Greek. Simply exposing yourself to new information and vocabulary terms helps increase your fluency and mastery of Greek. So every single day, GreekPod101 adds a new Word of the Day for you to learn and memorize during your commute. Have a short commute to work but still want to make progress towards learning and mastering Greek? Not a problem! Our Daily Dose Mini-Lessons are 1-minute or less and designed to improve your grammar, vocabulary, and pronunciation. You don’t need a PC or tablet to learn Greek during your daily commute. At GreekPod101, all of our lessons, tools, and resources are available 24/7 via our Mobile App. That means you can access all of our audio lessons and other tools during your commute to work or any time you have a few spare moments! In addition to the world’s largest online collection of HD audio lessons, GreekPod101 has also created several audiobooks to enhance your understanding and make it more convenient than ever to learn a language during your commute! The average commute time of most Americans is over 300 hours each year and it’s the perfect opportunity to learn and master a new language. In fact, you can use the “dead time” during your daily commute to learn a new language and potentially boost your lifetime earnings by up to $70,000 or more! Whatever your motivation, GreekPod101 has the tools and resources necessary to help you learn a new language each year during your commute to and from work. Act now and we’ll even provide you with a free audiobook to try out on your next commute! What’s the first thing you need to know when learning a new language? How to engage in simple dialogue of course! GreekPod101.com has taken care of this, as always. and will be surprised by the beauty and harmony of the Greek language—by the time you get through with this Greek greetings guide. Some might say that speaking Greek while visiting Greece is not a prerequisite. And this is probably correct, as most Greeks speak English at a very adequate level. However, greeting people in their native language is a great way to connect and learn new things from the locals. And believe us: You wouldn’t want to miss the big smile on their face once you greet them in Greek—yes, they really appreciate it! 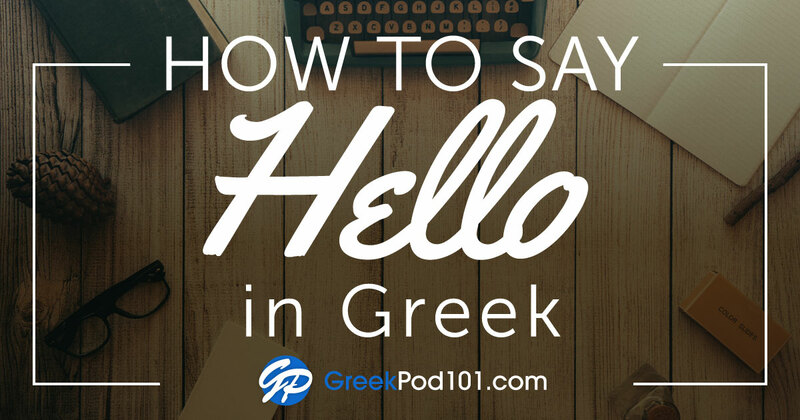 In this blog post, we’ll learn how to say “Hello” in Greek, as well as other everyday life greetings. From “Hello” to “Goodbye” and from “Good morning” to “Goodnight,” here you’ll find the most common expressions used for greeting other people, or for meeting new people. Whether you’re travelling or are visiting Greece for work, this Greek greetings guide will help you learn all the proper expressions. However, learning a new phrase is never enough. Together we’ll dig into Greek culture and explore Greek customs related to greetings. Do you prefer an audiovisual experience? Then check out our How to Greet People in Greek video! Are you ready? Let’s begin this journey! 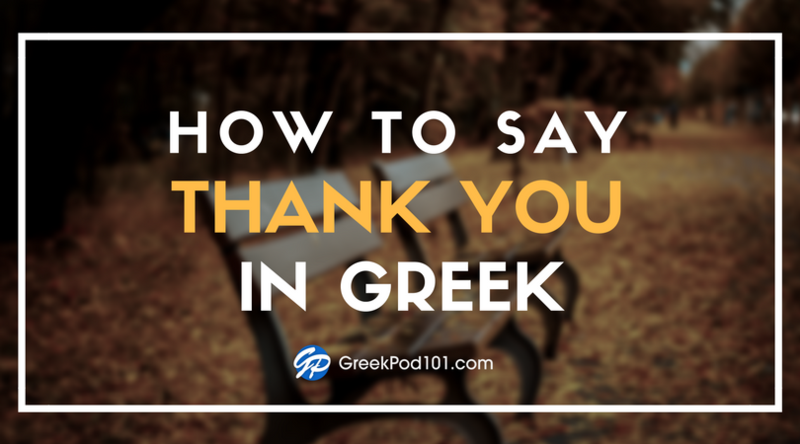 Learn how Greeks greet, along with the most important Greek etiquette. The most common Greek greetings for saying “Hello” is Γεια (Ya). It can be used for every occasion and is normally accompanied by a pronoun, referring to either a single person or a group of people. Therefore, Γεια σου (Ya su) is used when greeting one person, whereas Γεια σας (Ya sas) is commonly used for greeting more than one individual—or an individual with whom you need to be polite and speak formal Greek to. This can be someone you don’t know, or someone of a higher status such as your boss or someone significantly older than you. Does this seem too complicated? Well, we’ve got your back. An alternative, which can be used regardless of the number of people you’re greeting, is Χαίρετε (Hérete). So, if you want to be on the safe side you can use this. Nevertheless, this greeting isn’t quite popular amongst young people, so you should probably keep this in mind, as you might sound…a bit old. As already stated, in Greek you can use Γεια (Ya) regardless of the time of day and for both greeting and parting. Nevertheless, there are other Greek greetings, which are time-specific. As in English, Καλημέρα consists of two separate words combined into one: Καλή + μέρα (kalí + méra) = “good” + “morning.” It’s normally used when greeting someone in the morning, basically until twelve o’clock pm. Again, in this case Καλησπέρα consists of two separate words combined into one: Καλή + (ε)σπέρα (kalí + (e)spéra) = “good” + “afternoon.” This is used to greet someone throughout most of the day, basically from twelve o’clock pm until late in the evening. Καλό απόγευμα is commonly used instead of “Goodbye” when parting with someone during the afternoon, wishing them a good afternoon. For formal occasions, the honorific plural is used. Indeed, Γεια σας (Ya sas) is used for greeting a person in a formal way, which normally corresponds to greeting a group of people. This is the only difference regarding formal Greek greetings, as you can use all the other aforementioned expressions without any problems. If you’re fed up with the more common Greek greetings, especially if you’re a revolutionary teenager or even…a rapper…here are the appropriate greetings for you! Use them at your own risk as they may sound a bit inappropriate in most cases. Either one of the above alternatives can be used, without any restrictions, as they’re equally used by locals. Of course, the simplest expression is Χάρηκα (Ηárika! ), which can also be used as a parting expression, a way of saying “Goodbye” in Greek. Now let’s learn about some Greek greetings while answering the phone. Expressions while answering the phone in Greek are another integral part of greetings in everyday life. The most common answer is Ναι (Ne), simply meaning “Yes.” Below you can find other popular greetings for answering the phone. This is an informal Greek greeting over the phone. It’s normally used when the person who’s calling is someone you know pretty well, such as a close friend. It’s also used when you’re actually expecting this specific call, so no further explanation is needed. This alternative can be used for both formal and informal situations. For example, you can use it either when a friend is calling, or even within a business environment. This is another option which can be used in either a formal or informal situation. It actually motivates the caller to talk about the purpose of the call. As you can see, you can also use a combination of Alternative 2 and Alternative 3. The only difference here is that the greeting is more polite and can be considered a more formal Greek greeting. Just like the most common Greek greeting, you can use Γεια! (Ya! ), as an informal greeting when answering the phone. Add the word σας (sas), when answering a formal call and you’re set! Of course, depending on the time of day, you can also use the other appropriate greetings such as Καλημέρα (Kaliméra) meaning “Good morning,” or Καλησπέρα (Kalispéra) meaning “Good afternoon.” In the end, the choice is yours! Greeks are enthusiastic, kind-hearted, and a bit…loud. For greeting someone, just saying Γεια (Ya), will do the job just right. Γεια (Ya) is usually accompanied by the classic wave of the hand, especially if you’re greeting someone from a distance. In formal occasions, it’s common to shake hands, along with the formal greeting Γεια σας (Ya sas). Greeks greet someone they’re friendly with by air-kissing, i.e. touching cheek-to-cheek. Usually, they first kiss on the left cheek by tilting their head to the right, and then they kiss the right cheek by tilting their head to the left. When the people involved are very good friends, it’s common to hear a sound similar to “mwah, mwah.” However, this is only typical for Greek greetings between friends or relatives, and we wouldn’t recommend it for wide usage. Greetings are an integral part of everyday life. In many cases, using Greek expressions can really make a difference while talking or even cooperating with Greek people. When you use the Greek language, you take a step closer to your interlocutor and you create a new bond. You actually show that you care about the Greek customs, and it’s possible to get some inside tips and invaluable information even from strangers. GreekPod101.com aims to help you learn Greek in a simple yet effective way. We’re focusing on practical examples, which can be used directly in everyday life, without omitting references to the appropriate grammar and syntax. After all, what’s theory without practice? 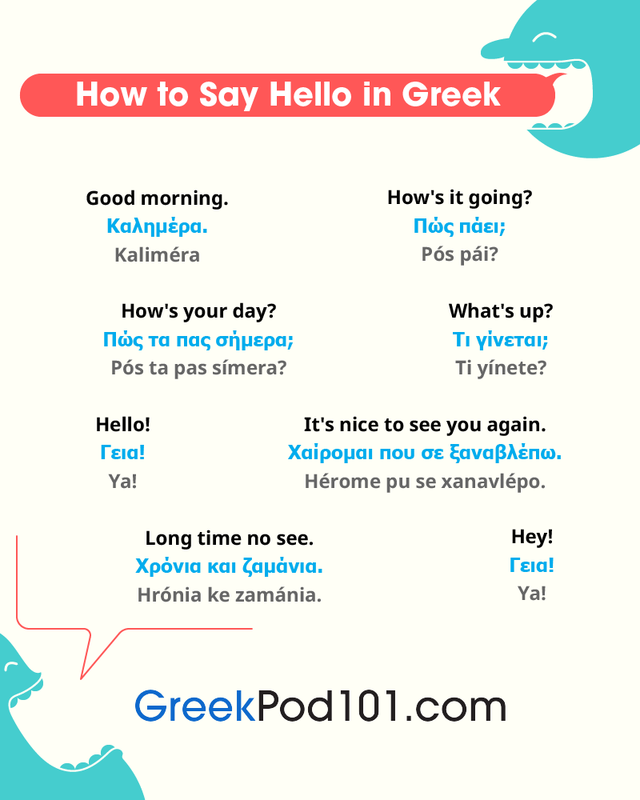 First of all, you can visit our Common Ways to Say Hello list in order to review, refresh, and expand your knowledge of Greek greetings. GreekPod101.com also offers you recordings of each phrase, which can help you with pronunciation. Feel free to explore more lists and resources, in order to take your Greek knowledge to the next level. Our website offers practical tips and advice, aiming to teach you Greek, just like locals use it. Practice makes perfect, so what are you waiting for? Begin today with our Greek Greeting Lesson.